Researchers from the University of Pittsburgh Schools of the Health Sciences and UPMC have uncovered the molecular mechanism underlying corticosteroid resistance in severe asthma. The new findings have important clinical implications, suggesting that corticosteroids, the main treatment for asthma, may worsen the disease in this group of patients. The research was published in the journal JCI Insight. Asthma is a lifelong disorder characterized by airway inflammation that leads to wheezing, breathlessness and coughing. It affects up to 10 percent of the population of the developed world, including more than 20 million Americans. Inhaled corticosteroids can reduce airway inflammation, but these drugs are ineffective in 5 to 10 percent of patients with severe asthma. The researchers had previously shown that increased levels of the inflammatory protein interferon-gamma are produced in the airways of about half of severe asthma patients. Using a mouse model of severe asthma, the researchers also showed that interferon-gamma was responsible for poor lung function. In the new study, they investigated whether interferon-gamma signaling is responsible for the poor response to corticosteroid therapy of some severe asthmatics. The work focused on CXCL10, an inflammatory protein that is induced by interferon-gamma and recruits the immune cells that produce it, perpetuating the cycle of inflammation. 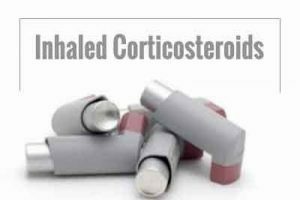 CXCL10 was elevated in the lung cells of about half of severe asthma patients treated with a high dose of corticosteroids. In addition, CXCL10 levels were higher in severe asthmatics than in patients with milder asthma whose symptoms were managed well by corticosteroids or other treatment modalities. When the researchers broke all asthma patients down into two groups — high and low CXCL10 — they found that the high CXCL10 group had worse asthma control, as evidenced by more emergency department visits and asthma flares in the past year. Next, the team used cultured immune cells to show that corticosteroids, which have broad anti-inflammatory and immunosuppressive functions, fail to suppress CXCL10 gene expression in immune cells. They found that this occurs because of a surprising mechanism — corticosteroids actually stabilize the signal from interferon-gamma that stimulates CXCL10 production. The team plans to further investigate this pathway in search of ways to block the inflammatory loop perpetuated by CXCL10 and interferon-gamma. “Over the next few years, we also hope to show that CXCL10 can be used as a biomarker in the clinic to help identify patients who will not respond to corticosteroids, sparing them from the significant side effects of these medications,” Ray said.